Taking cognizance of the Institute of Chartered Accountants of India Notification in respect of CA Intermediate (IPC) Examination 2018 Due to be held in May 2018, we look forward to the Apex Institution to Shortly Release (Tentatively) in February 2018 in respect of conducting CA Common Proficiency Test 2018. 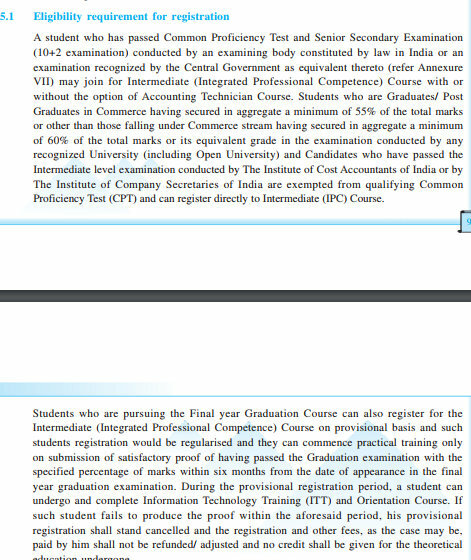 The Candidates meeting with the Eligibility Criteria as cited by the Institute of Chartered Accountants of India vide the following Clipping would be Apply Online. The Candidates are advised not to submit Printouts of Online Application Forms in the Offices of the Institute of Chartered Accountants of India other than those mentioned above and obtain Acknowledgement Receipt for having Deposited the Printout of the Examination Form By Hand. The Candidates should only Mail / Send the Printout of the Application Form through Speed Post / Registered Post (not Courier) without Folding and Superscripting the Envelope as “Examination Application Form – Intermediate (IPC) Examination / ATE May 2018” so as to reach us before the Cut-off Dates given above. The Candidates are Advised not to send their respective Applications through any Courier & to Retain the Receipt issued by the Post Office till the time of Receipt of the electronic Admit Card. The Students may note that the Marks Allocation for Sections A & B is 50:50 in IIPCC Paper 4: Taxation and 60:40 in the New Intermediate Paper 4: Taxation. The Institute of Chartered Accountants of India shall Release the electronic Admission Certificates for the Candidates Minimum 03 Weeks Prior to the Date of Commencement of the Integrated Professional Competence (IPC) Examination. The e-Admission Certificates issued for the Candidates shall bear out the Instructions on Do’s and Don’ts for Compliance. The Candidates must carry with them the Prescribed Documents together with their respective e-Admittance Tickets while Appearing for the Integrated Professional Competence Examination / Final Examination. Log into The Institute of Chartered Accountants of India Website for Online Registration. Log into The Institute of Chartered Accountants of India Website for Admit Cards Downloading.